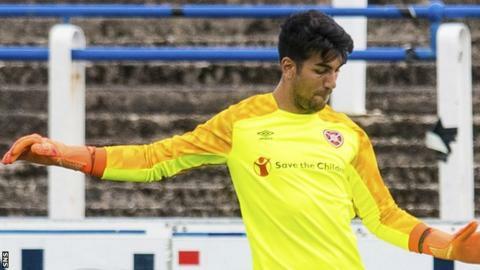 After a successful trial, goalkeeper Kevin Silva has signed a two-year deal to become Hearts' 13th summer signing. The American stopper, 20, has been training with Craig Levein's squad since the start of their pre-season programme. He featured in friendly fixtures against Arbroath, Partick Thistle, Queen of the South and Forfar Athletic. Silva goes straight into the squad for Wednesday's Scottish League Cup match against Cove Rangers. The Pennsylvania-born player had been with Rutgers Scarlet Knights, a university team from New Jersey. He is the second goalkeeper signed by Levein this summer, following the acquisition of Czech Zdenek Zlamal. Both will compete for the starting berth vacated by Jon McLaughlin, who moved to Sunderland. Defenders Ben Garuccio and Peter Haring, utility man Bobby Burns, midfielders Jake Mulraney, Oliver Bozanic, Olly Lee and Ryan Edwards, as well as attackers Steven MacLean and Uche Ikpeazu, have also joined Hearts. Scotland forward Steven Naismith returned to Tynecastle on loan from Norwich City. Striker David Vanecek has signed a pre-contract with the Edinburgh club and is set to join in January 2019. Hearts play their first competitive game of the season against Highland League Cove in Group C.